No one knows how she got there, but it's certainly a miracle that she's still alive. Laura and Renee Garrow, two residents of a Norfolk, Virginia, neighborhood, were taking a walk on New Year's Day when they passed a box on the curb. The box was sealed heavily with duct tape and then sealed inside a plastic bag and left out with the trash in the rain. And the box was moving. 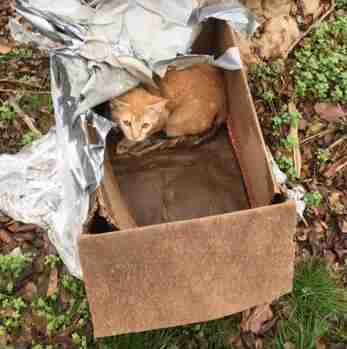 When they opened it, they couldn't believe what they found: a small orange cat, about 6 months old, who cuddled up to them as soon as she was lifted out of the makeshift coffin. The Garrows contacted their neighbor, Lisa Suhay, who had a cat carrier they could borrow. 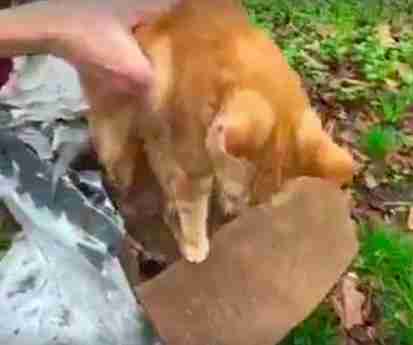 When Suhay, a longtime animal lover, learned about the cat discovered alive in the cardboard box, she was outraged. "I have turned this problem around a hundred different ways to find a reason any decent human being would do this, and there just isn't one," Suhay told The Dodo. While Suhay, a journalist, started investigating who could have committed such a horrific act, her leads turned out to be dead ends. Meanwhile, the cat - who isn't microchipped or spayed - was taken to Norfolk Animal Care Center where she is currently being held for five days to see if anyone claims her - if no one does, Suhay is antsy to welcome the little kitten into her own animal-friendly home. "A lot of people are very pessimistic about the future of animals in this country," Suhay said, adding that she's noticed how many people feel like there's nothing they can do to help. "But you can be just anybody and help an animal even in small ways." Not only could Suhay provide a home to the cat who was pulled from the brink of death, she could also do something positive for other people who want to help animals. So Suhay started a campaign for the next person who wants to adopt an animal in need, but may not have the money up front for shots, spaying or neutering - especially right after the costs of the holidays. "Realizing that lots of people just like us would love to adopt and can afford the day-to-day costs, but not the chunk out of the budget for the adoption/spay or neuter/shots, I am doing this little GoFundMe to pay it forward for whoever the next rescuer may be," Suhay wrote on Facebook. "A nice surprise for the next good Samaritan." In the meantime, the lucky cat will be starting a new life this week, in much kinder hands than before. "At first, I was just angry, and I wanted to find justice," Suhay said. "But then that feeling left me, and I realized I could do something positive." Suhay plans to pick up the cat on Thursday afternoon and is thinking of naming her Rose. Until then, she's been visiting her at the shelter. Donate to Suhay's GoFundMe campaign here.